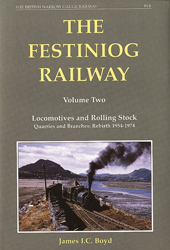 A welcome return for this reprint of the concluding volume of James Boyd’s extensive history of the Festiniog Railway, which was last published in 1975. This book offers a detailed survey of the railway’s historic locomotives and rolling stock which includes numerous photographs and plans. There is a detailed section on the railway’s operation which includes a number of signalling diagrams. Specially drawn plans are included showing the Rhiwbach Tramwaty, the quarry complex east of Duffws, Cwm Orthin Tramway, Oakeley Quarry and the Festiniog Granite Co. branch. The story concludes with a history of the first 20 years of preservation.